Shrinking disk, spot weld saw, 3M clean and strip disks. Fender bucks (supports), dollies, spoons, bulleye pick, body files. If you have seen my other project thread, "My Ratsun Datsun 521" you may have seen hints and pictures of this 521 in the background. These pictures were taken in 2007, and I started a project thread on OldDatsunPickupLovers.com a domain that got absorbed into another website. Already too many words without pictures. I do not have the complete paperwork on it, but I do have a registration slip from 1978, and a record check shows it was bought by my family in March of 1977. The latest registration slip I have for it is for 2005, and was not sent in to DMV for renewal. In about mid 1995, I bought a 1992, or about Ford Aerostar for a daily driver. I needed something that would haul sound equipment out of the rain. In 1996, I bought a new Ford Aerostar, and it still is my daily driver. This Datsun served as my daily driver from 1977 to sometime in the mid 1990's. For a few years, it just sat in a carport, somewhat out of the rain, except for leaks in the carport roof, for several years. Sometime in the mid 2000's, I decided to give this truck, named Dragon, some attention again. To my disappointment, when I moved Dragon, after sitting a few years, I found some of the core plugs in the ground, where Dragon was parked. A little bit of history on Dragon. It was bought to replace another 521 I had, that I crashed. Dragon was used to pull a two horse trailer, pretty much all over the Pacific Northwest. When the OEM engine in Dragon got tired, I bought a JDM L-18. Now the sad part of that. It was very rare fuel injected L-18, and not knowing what it would be worth, and being young and dumb, I just yanked off the fuel injection manifolds, and put the L-16 carb on this L-18, and ran it that way. This is the really dumb part. Do not hate me. I just turned the aluminium four cylinder fuel injection manifold for scrap. The L-18 also has a fully counterweighted crankshaft, with a five bolt flywheel on it. In the very late 1970's or early 1980's this truck got a Z-car five speed transmission. This is when the five speed was only available in the Z car, and I ordered a new five speed, from a local dealer, Kellum Datsun, In Gladstone, Oregon. This is my other thread, "My Ratsun Datsun 521"
This post was edited July 14, 2017. 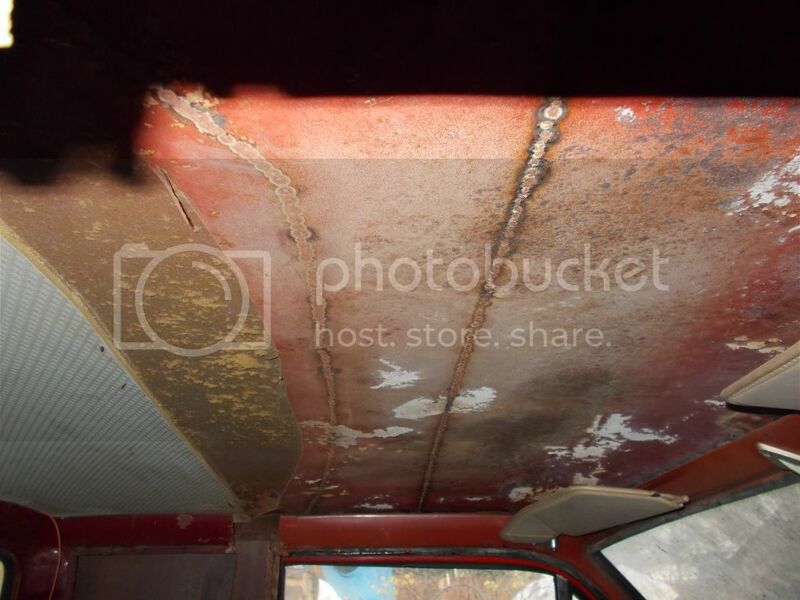 The picture links were on a formerly free photo hosting site, that decided to start charging a lot for third party posts. The photos were uploaded to some space on my internet service provider, Spiritone, in Portland OR. and the links for the pictures were changed. These pictures were taken in 2007, using a film camera, and waiting for the pictures to be developed, and transferred to a CD. This post was edited again, November 20, 2017 The picture links were on a formerly free photo hosting site, that decided to start charging a lot for third party posts. The photos were uploaded to some space on my internet service provider, Spiritone, in Portland OR. Then Spiritone had some problems at the end of September 2017. I have registered a domain name, " stormyhill.com " and I am now hosting the pictures on a server I am paying for. Hopefully, that will be more permanent. The links for the pictures were changed again. These pictures were taken in 2007, using a film camera, and waiting for the pictures to be developed. Then they were and transferred to a CD. If you looked at the left side of Dragon, you may have noticed a rust hole in the bottom of the left fender. Here is a close up picture. I do not remember when, 2007, or 2008, I made a trip up to Yelm, and bought some parts from another Ratsun member. and I cut the rusted section out of Dragon left fender. I also cut a similar pieces out of a fender I got in Yelm, and tried to gas weld it in to Dragon fender, to repair it. That was two or three years ago. What I did last Friday, November 29, 2012. I am putting the date in this because although i was able to recover the text I put in to the old ODPL thread, the dates I made the entries dissapeared. Some of the weld was pretty good, but near the edge of the fender heat distortion got away from me. I decided to cut the bad lumpy part of the weld out. To cut straight lines in the fender metal, i just used a 1/32 3"disk in a die grinder. to cut straight lines, I use a scrap piece of steel, clamped where I want to cut, like this. I cut this patch piece in a like manner. And fitted it to the cut out hole in the fender. Before welding, I clamped a few pieces of copper to the fender. and then started to weld in in, using a wire feed welder this time. Yesterday, I ground the welds off. I also hammered the welds a bit, to reduce the heat distortion from the weld in patch. The trick is to only tack weld when doing this type of repair, when welding sheet metal, if you hold the trigger much more than a second, things start getting hot and warping. I tack welded this on with no warping at all, and it will hold, as my 69 521 KC was done the same way, everything was tacked on except the floor connection, it was done in 1 inch welds spaced apart. Thanks, but looking at the backside, I do not have full penetration in all areas. I have a Miller Autoset 180, and can change the wire speed, and the voltage. I am using .023 wire, with argon/co2. What do I to increase penetration? A fair amount of the time, when I try to strike an arc, it just pops, burns off the wire, and wire sticks to the tip is comes out of. I do have the wire feed pressure light, that way if the wire sticks, it just stops, instead of "birdnesting" at the feed roller. Any ideas for that problem? 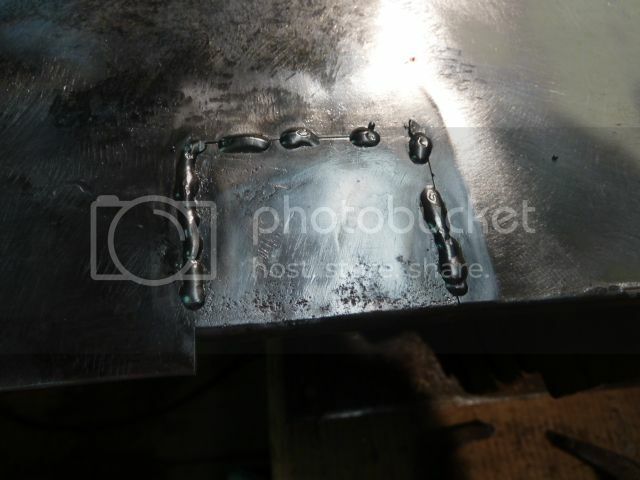 Here is a picture of the top of the weld, ground off, and hammered. This is what the back side looks like. After I finished the weld, I ground off the weld bead to almost flush with the base metal. At that point, the patch was pretty flat, and the area by the patch has a slight high spot. I hammered the weld, and base material got much flatter, but now the patch has a high spot. did I hammer too much? Could I shrink the patch, to make it better? I realize a lot of this is just trial and error, and just learning the skills and technique. But I am open to any advise you have. If you know how to shrink metal with the proper hammer, then you have it made, but most of us(like me) only know how to expand metal, which is basicly hitting it with a hammer with backing will expand it. On the fenders that you are repairing, I would likely do the welding on the back, and leave the front smooth, as for penetrating. 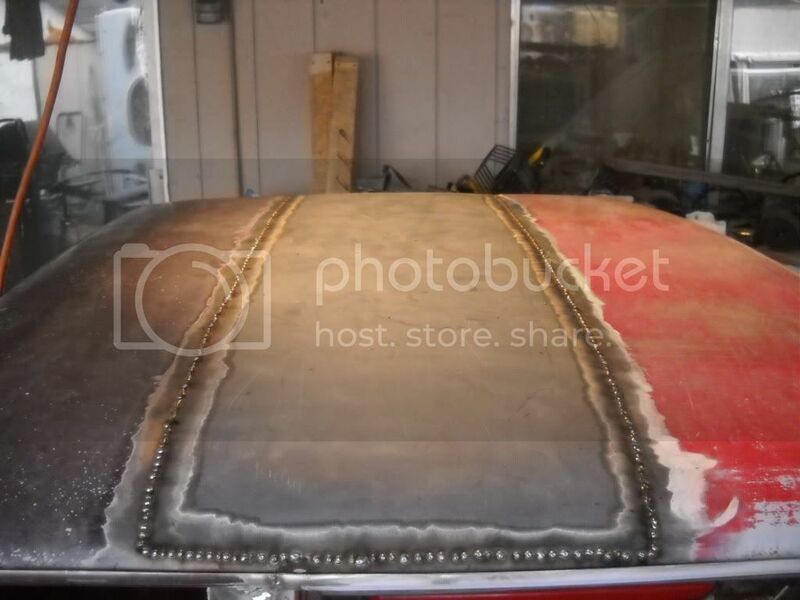 if you run a bead, meaning if you pull the trigger and hold it, the metal is going to get to hot and warp, and possibly blow holes through it, you can only TACK sheet metal, see the photo of the 520KC top I posted above, I tacked it every 4 inches, then I tacked it between, then I went between again, and after they got to close together I just moved ahead 4 inches and tacked it, move 4 inches and tack, this way the metal doesn't get hot enough in one area to warp. Penetrating like your talking about on sheet metal would take an artist, as basicly one has to melt all the way threw, without blowing threw, and that would be beyond most experienced welders, my neighbor across the street did what your talking about he tigged it, and it got to hot and warped anyway, but he got full penetration. On most of the sheet metal cab fabrication I do, I tack from the outside, as I have no other choice, I do not try to do what your trying to do, as it will just blow holes in the metal, I just tack it, and when I am done, I can see on the inside of the cab the burn lines, it got hot enough to hold. I have what I would call a basic understanding of shrinking metal, but by no means are an expert at it. There are a couple of ways I know. One way to to hammer off dolly, putting a dolly underneath the panel, on the low spot, and pushing up as you hammer on the high spot next to the low spot. Another way is to heat a small area with a torch, this causes it to expand even more, and while it is still hot, hammer off dolly. The hot metal shrinks into itself a little easier when hot, and as it cools, it shrinks even more. I have also heard of a shrinking disk, a stainless steel disk you put on an angle grinder, and the friction of the disk, and pressure from the disk shrink the metal. To stop blow through, I back up the welds where I can with some pieces of copper. I really need to take my own advise, and take a welding class at a local community college. This is a shrinking disk on an angle grinder. I was able to remove a lot of the warpage from the welded patch, but I only had a little bit of time to work on the fender today. OK, a little basic theory on shrinking metal. Two posts above, I described three ways to shrink sheet metal. Two involve heat. If you heat sheet metal, it expands. If you heat a small area in the center of a panel, that area expands, and the colder metal surrounding the heated area forces the heated bulges higher. When the metal is hot if you hammer the bulge down, and back up the back side, the bulge really has nowhere to go, so the metal pushes into itself, and actually shrinks. When the metal cools down to ambient temperature, it shrinks some more. A shrinking disk is made of stainless steel, and rubs on the metal, but on lumpy spots, only touches the high spots, and localizes the heat. The slight vibration from the disk pounds the metal down, and if the metal is firmly backed up, it works the high spot down. When the metal cools, it shrinks a little more. From my very limited experience, you use the disk in short pieces of time, and try to prevent the whole panel from getting warm. Just heat the actual stretched high spots, and allow the metal to cool. I know I am being a little vague, but I am just learning this technique. I am using this fender as a learning tool, and if it turns out good, that is a bonus. If I cannot salvage this fender, at least I will have learned something. Remember, the bottom of this fender started looking like this. I needed to get a piece of decent metal for the front of a fender, but the headlight bucket was in the way. I needed to remove the head light bucket from the fender. This is a spot weld saw. The first step is to find the spot welds. Sometimes this is easy, and sometimes they are hidden under thick paint, rust, collision damage, or who knows what. but if you clean off the paint, and rust they are pretty easy to find. I use a "Clean & Strip" disk, from 3M. This is one version, I think I got it at Ace Hardware, or Home Depot a while ago. I most recently ordered some off Amazon, used 3M part number 07471. With that you get the industrial ones, but you also need a 1/4 arbor to hold them. The disks only have a 1/4 inch hole in them. This disk removes paint, rust, plastic filler, but is pretty gentle on good metal. When the welds are clean, center punch them. Need to take a picture of center punching a spot weld, and put it here. If you are careful, the spot weld saw will center on the center punch hole. But sometimes it will skip out from the hole. Drilling a 1/8 hole in the spot weld makes it much easier to hold the spot weld saw in place. If things go well, when you cut the last weld the panel pops apart. If you miss the center of the weld, and some weld remains, you can sometimes just pry it apart. The top spot weld in this picture was done twice, and I had to drill the two welds. And finally the headlight bucket is free from the fender. getting a patch made for it. The front of the fender did look like this. It looks like this now. I worked most of the dents out of it like this. Put a picture of the right dolly inside the fender here. But I did not use a hammer on the top of the fender. I used one of these spoons. the under side of the fender. Put a picture of using the leaf spring to slap the fender front here. spring) works the high spots lower. This fender also has some minor damage here. Most of this was fixed by a "Pick and Filing technique"
This is a bull's eye pick. A closer look at the business end of the pick. And this is a body file. These are the teeth on the body file. A few areas I used a body hammer to raise low spots, but most of it was done with the bulls eye pick. This is what the fender started off looking like, I know, same picture as above. A little bit of work, and this. The body file does not really remove that much metal. In fact, it is used more to just locate high spots. In the pictures, you can also see a sanding block that I used. It has a piece of 80 grit paper on it. This fender has the back brace, and headlight bucket removed, for access. It is pretty floppy, and due to the repair on the bottom, formerly rusted out corner, I have not bolted it to a truck yet. Putting the brace, and the bucket back in probably will make it necessary to do some more finishing body work on the fender. This is the top of the fender, near the front. concave, instead of convex. that also made a few challenges. By using hammers, dollies, spoons, and pick and filing, i got the fender to this point. and then to this point. the bottom side of the stretched out areas, that being low, is a high spot on the inside of the fender. A quick review, this is a shrinking disk. After that, the top of the fender looks like this. some things around. I will finish it after the headlight bucket is welded back in. The plastic on the interior rear view mirror for Dragon was real bad. I was at Sherwood Pick-n-Pull, and just started looking for similar mirrors that mounted the same way, and found one in a Mazda B2000 truck. This is the Mazda mirror on the Datsun pedestal. Google translator came back with this. Dragon has some front end damage. Review picture. I need to find this picture, it is probably in an old computer "005_2a.jpg"
That is a old picture, from November 2007. The lower core support rail, the sheet metal part the parking lamps bolt to was replaced long ago, and just pop riveted on. But the actual core support was not straight, or exactly where it needed to be to fit front end pieces correctly. You can remove the rail with a spot weld saw. This is the rail removed. With the rail removed, it is really easy to straighten. However, with the rail removed, the core support is basically two flat panels, especially in the headlight bucket area. I cut these pieces of metal out of some 1/2 plate steel. The smaller pieces fit inside the headlight bucket like this. And the big plate is bolted to the smaller pieces like this. I also made some pulling eyes like this. They bolt to the plates on the inside and outside of the headlight bucket, and you can pull the core support like this. I did some work in the sun visors for Dragon yesterday. The visors are just held in the cab with two #10-32 oval head Phillips head screws. Took the visors out and and scrubbed them with a nylon brush, and a cleaner. I used two different cleaners. Fantastic, and Dawn dishwashing detergent diluted in water, in a spray bottle. I did one, and took this picture. The Fantastic worked a little faster, but has kind of a bad smell, and the smell stayed on my hands a long time. On the second visor, I wore niIrile gloves when using Fantastic. A dust mask may not be a bad idea, the brushing makes a very fine aerosol that you inhale. The Dawn solution works a little slower, but is much more gentile to your hands. The pivot on one visor was stuck. I removed the screw, with a #1 Phillips screwdriver. A quick word about tools, especially screwdrivers. You need good high quality ones. It is difficult to make make a steel screwdriver tip hard enough not to wear out quickly, but but not so hard it is brittle. This takes making some steel alloys with some expensive rare metals, and some critical heat treating steps. This makes a good screwdriver expensive. But one good screwdriver will last a long time. A good screwdriver will also fit the screw head better. Less of a chance of stripping out the head of the screw. Use lots of down pressure on the screw, and you have a good chance of breaking the screw loose, without damaging the screw. OK, back to the visor. Here is the pivot parts. I then clamped the metal arm for the visor in a vise. And used a big Cresent wrench to free up the pivot. The visor pivot is a tapered pin. I cleaned up the pin with a rotary wire brush, and put a little dab of white grease on it, and put it back together, and then put the clean, and moving visors back in the cab. There is also a screw in the visor itself. if your visor flops down too easy, you can tighten this screw a little, and it will hold the visor up. you can also loosen this screw, and by turning the arm in the visor, you can find one point where a tab on the arm will align with a slot, and completely remove the arm, should you want to get it rechromed. nice run down. I cleaned mine when i got them but they could use another once over. And great pic of the pivot parts. i've been meaning to take mine apart for cleaning and lubing. windshield removal, cutting bad weatherstrip. prime and paint small parts. January 1, 2013 Dragon odometer shows 33.006 miles. Like I mentioned in my other project thread, I did get signed up for an auto restore class at Clackamas Community College, and my plan is to use the class for access to the paint booth at CCC, to finally get some paint on fenders. The class got cancelled. Rats. Today, I was able to get some wash primer on the left inner fender and inside of the left fender for Ratsun. I also was able to spray some wash primer on the inside of this fender that I plan on using on Dragon. Daniel, the work you did fixing the dents on that fender is pretty impressive. The fender in the above picture is one I got from D510Addict, not the fender I have cut and sectioned pieces out of. 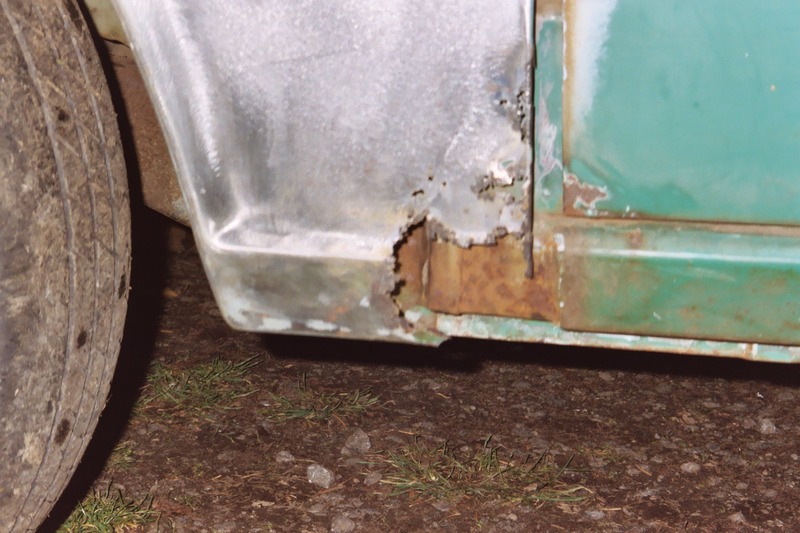 However, the fender did start out looking like this. and the front of the fender. In those two pictures, I already sanded the tiop of the fender, above the style line, and below that, I just pressure washed the fender. In this picture, I have done a lot of sanding. And uncovered this plastic filler on the front of the fender. There were also these minor dents in the middle of the fender. To get access to the front of the fender, I removed the headlight bucket with a spot weld saw. or even bolted on to Ratsun. This is a plate I made, that is bolted on to Ratsun, where the front apron would normally be. I have found it is a lot easier to remove dents from the fenders if they are held securely. In many cases, that means bolting it on the cab, but in some cases, the core support in in the way of getting to the front of the fender, and so I made the fixtures to hold the fender in position, without cab sheet metal being in the way. working the top side with these spoons. Add picture of slapping top of fender, with dolly underneath. and to find high spots, a body file.